Takrut or better known as ‘Tangkai’ by other culture is a well-known talisman of Thai origin for a long time. It is a holy scripture texts in the form of summarized Yant mantra written onto a sheet of lead, silver, copper or even gold. 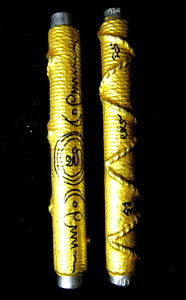 The inscribed Yant is written on it and then crafted according to arcane sciences and deep meditation by the guru monk or Archan before they are handed out to devotees. 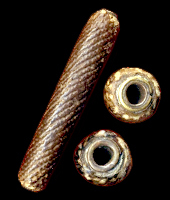 Takrut scroll can be easily distinguished with its rolled up form with sacred Yant scripts written on the scroll. Thais strongly believed in the power and sacred magic of Takrut for its effects in offering protection and increase serenity of mind to the bearer. This occult practice had a long history since the Ayutthaya warring period that is still very popular until today. Takrut is usually worn by Thai men on a waist cord for its protective efficacy (Kongkrapan) against harm and danger and on the neck for authority (Maha Amnat). Takruts made from lead, tin ore and copper sheets are appropriate for warding off danger, accidents, sharp weapons and bullet fires (Konkrapan or invulnerability), authoritative power (Maha Amnat), dispelling evil forces and scheming characters. Those made from silver and gold are appropriate for dispelling off demons or dark evil forces and it has the capability in helping the wearer to attract kind benefactors, accumulate wealth fortune (Pokkasap) and gaining good affinity with people (Metta Mahaniyom). 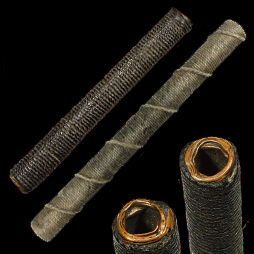 It must be noted that there is a vast variety of Takrut scrolls made from many different materials such as Prajioud armband usually worn by Thai Boxers, Monk’s waist belt, Tiger fur, Snake skin, Bamboo, Bullet shell, auspicious type of wood, etc. In whichever form of material it may be made from, it always come with a written Yant scripture and further sanctified by the master maker to make it efficacious. Today this famous Prajioud armband made popular by Ajahn Thamma Chot continued to serve every Muay Thai boxers in Thailand. It can be said that the evolution of Takrut history started from the Ayutthaya period. In retrospect, Takrut talisman is very popular with people in dangerous professions such as police or military. However, the usage of Takrut does not only confine within these dangerous profession alone. Anyone can carry this talisman for added protection or for a special purpose as specified by the maker. It works similarly with any other type of contemporary amulets but just that amulets can have various designs and can contain many materials. We can conclude that Takruts and other contemporary amulets are in the same talisman platform to offer safety, protection, and blessing to the wearer. There is no known restriction about wearing Takruts and amulets at the same time as they are relatively compatible. Takruts comes in different lengths and sizes, type of materials, and a variety of colours. The vast array of amazing Takrut makes it very popular amongst believers and collectors. Takruts at large has many genres by the type of materials it was made from. We have already mentioned some of the popular materials in this article earlier. There are many accounts and incidents where Takruts had helped the bearer to escape from dangerous situations unharmed. In particular tin ore has the unique capability in deciphering poison and danger. In our own research, early Takrut batches by Porthan Lek of Wat Ariyakiri are usually made by using tin ore material. Dangers and harms will vanish into thin air if the tin ore Takrut is used appropriately by following the Master’s guidelines and recitation of its specific Katha. With deep respect to all sacred objects issued from Wat Ariyakiri, the hand pump incantation scrolls and hand inscribed Yant scrolls made by Than Lek himself is also equivalently effective. With clear comprehension we must come to understand correctly that Buddhist doctrine is mainly concerned with the Dharma teachings only. Arcane knowledge for creating talismans such as Takruts, Mai Kru Tongkat, GumanThong, Phra Phrom, etc. can be said to be originated from shamanistic arcane sciences in this respect. However, we must also take into consideration with regards to the incorporation of sacred Buddhist recitation verses being formulated into the making of such talismans by most Buddhist masters. The most powerful aspect of a Takrut is its defending power in warding off lethal weapons, increase personal affinity, and decipher dangers which is why everyone would aspire to have it. In other words, Takrut incantation scroll is basically a multi-function treasure. There has been a lot of reported incidents about Takrut's capability in providing protection and helping people to escape from narrow death. Many of these accounts are reported in Thailand but we managed to get one story incident from Malaysia. Whether the stories revealed here are shocking truths or mere fabrications, readers are advised to read at own discretion.